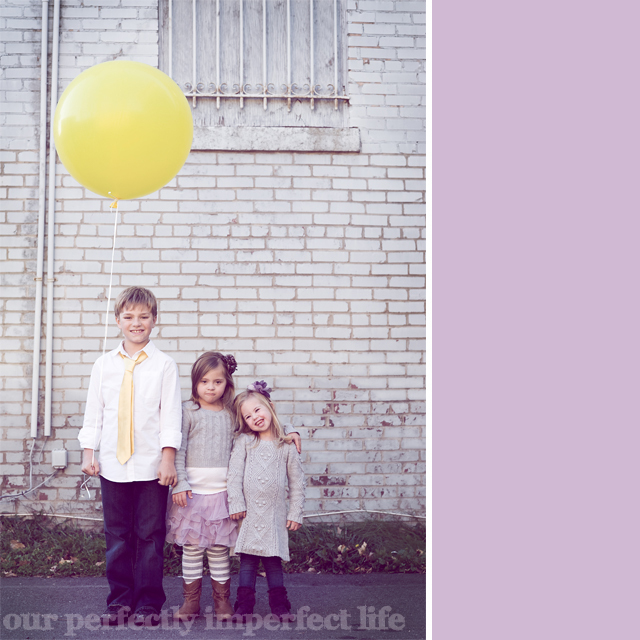 our perfectly imperfect life: Clutter be gone. If I had a dollar for every time in the past few years that I have said that I need to get organized, I'd be rich. Once upon a time... my sink was not piled high with dishes, my laundry room didn't have clothes scattered in every direction, my kitchen table wasn't full of school papers that belong to Lord knows who... you catch my drift. Thus began life with my babies. And I love them so. But my organizational skills are gone... mostly because of all the added stuff that my babies bring to our home. I always have big aspirations... but you know how those usually pan out. But now... now, I'm gonna git 'er done. Swear. A couple years ago, I needed a solution for the kids' backpacks and coats. The kids would come home each day and throw their stuff on the floor and go. I knew this little nook off of our foyer was the perfect spot. To this day, this is one of my favorite little areas of my house. I know, right... don't take much to keep me happy. It was rather cheap to put together... although there is no price that you can put on organization for your kids' clutter. I chose amber colored accents because my dining room is opposite this area and I wanted the colors to compliment each other. 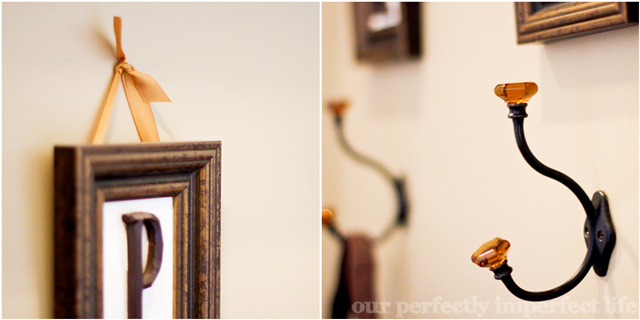 The frame assembly is simple: dispose of the glass, replace it with scrapbook paper (a printed paper would be cute), glue the spray painted wooden letter to the scrapbook paper and wa la. The ribbon came tied in a bow, but I snipped it and tied it into a knot around the nail for a more streamlined look. Tip: Make sure you use anchors for your hooks... they take a huge beating from the kids using them every day. And... I used to have a big framed image on that ledge... one day it fell when something hit it and the glass shattered. My advice... keep the area kid friendly and use a canvas (Canvas on Demand makes a beautiful canvas... save 25% on your order using code sleighbell25 now through December 11th). Since then, I came to realize that I needed a solution for all the stuff that comes home in their backpacks. When you have three kids emptying folders all at once... things tend to get confusing. "Whose paper is this? Who brought this home. Whose book?" Between that and the things we keep at home to work on (i.e. sight words, tracing books, math worksheets, etc etc etc)... there is crap everywhere that ends up getting buried and lost. Sigh. I have been on a mission to find mailboxes like these for awhile now... much harder than I thought it was going to be. 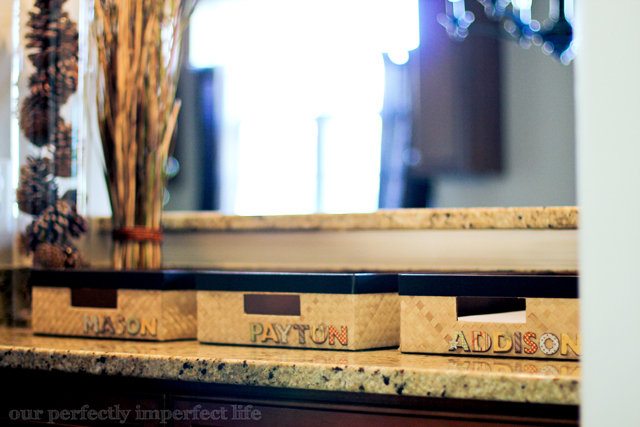 I ended up with these baskets from Michael's craft store (don't forget to use coupons)... perfect for what I envisioned. I also got multi-color alphabet scrapbook stickers to spell out their names on their mailbox... love. I had to glue them because of the basket weave... easy peasy. 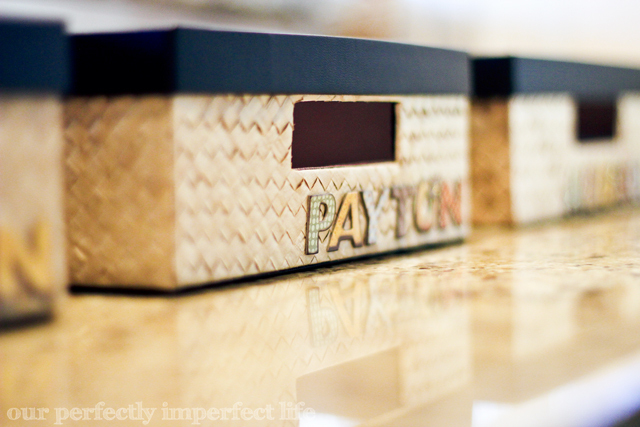 The mailboxes are sitting on the counter in our butler's pantry (our builder named it that, not us... Payton killed our butler), right off the kitchen for easy access. Clutter be gone. Ha... we will see. Mason: Mom, I can't find the elf. Me: I saw him upstairs. 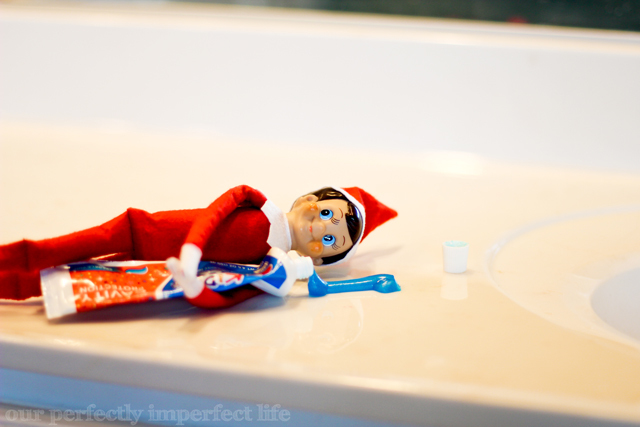 Me: In the bathroom... he hijacked your toothpaste. Mason: But the book said he isn't supposed to go upstairs. Me: Well... Rex has been very naughty this year. Seriously... if I'm gonna keep up the wonder of Christmas, I need to get on my game. Mason has questioned everything this year. 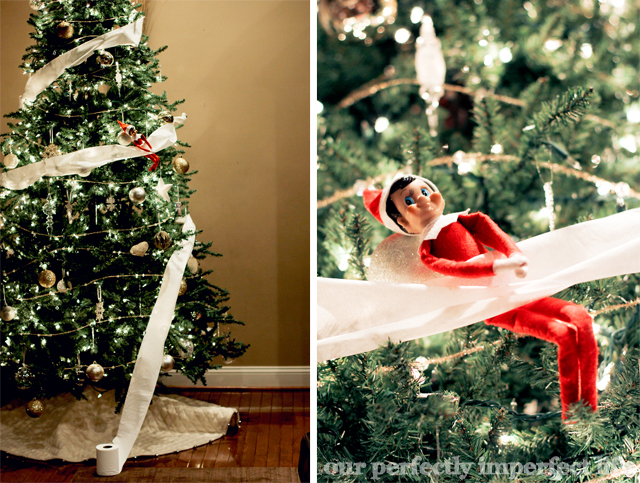 Mason: How did Rex get stuck in the middle of the tree when he wrapped toilet paper beneath him? Me: Well... he is magic and he must have jumped. Hilarious. I wonder what Mason thinks in that cute little head of his when I tell him these things. Probably Dude, my mom is whacked! We are off to revel in some more holiday cheer. Meanwhile... check out this gift guide from The TomKat Studio... I will take one of everything, please. Try to be creative in your gift giving... I promise they who receive will never forget. Reminder... enter to win an adorable hat from Freckles & Firecrackers... contest closes tonight at midnight EST. You have noooooo idea how much I need to get organized!!!! I could steal both if these ideas!!!! And I just might! We too have these problems! You continue toninspire me! Love it all!! Those boxes are perfect! Just have to say.... Love the pic of the kiddos, SO cute! 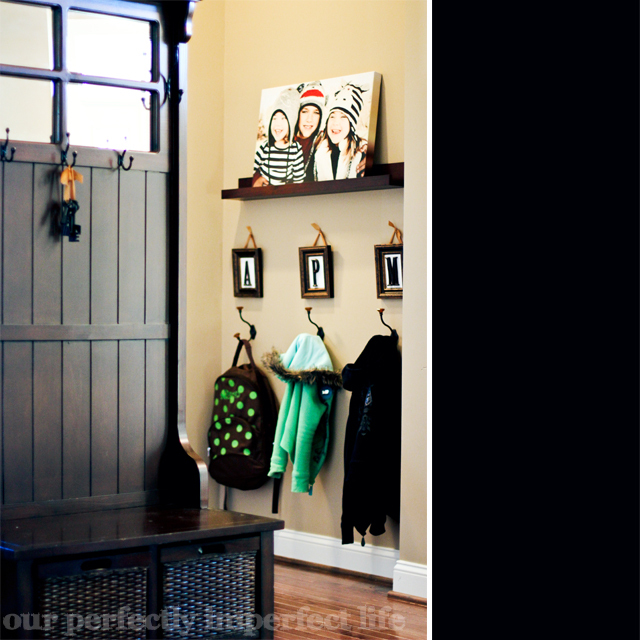 LOVE the entry way! I may be ripping you off in my house very soon, once I get all my crap done! BTW, I'm totally stealing the sound effect Wa la. Your blog is awesome Bethany:) Always puts a huge smile on my face to see your beautiful family, your amazing photos and your great ideas! Thank you for the tip about TomKat Studio. LOVE it:) Got several great gift ideas! Great photos. Love your little naughty elf, too. Seriously your blog is my new favorite blog. Love all your photos and elf ideas. Your children are precious beyond words. Thanks for the comment over on mine. I'll be visiting here lots, I'm sure!